After Crouching Tiger, Hidden Dragon became a huge crossover success in 2000, becoming the first foreign language film to gross over $100 million in the United States and the first martial arts film to be nominated for a best picture Oscar, it would’ve been perfectly natural to assume that a sequel of some kind would be coming. The universe was rich and the film was based on one of five books in a series. It wouldn’t have been so natural to assume the sequel would come 16 years later and debut on Netflix’s streaming service. Especially since nobody would’ve known what Netflix streaming was. 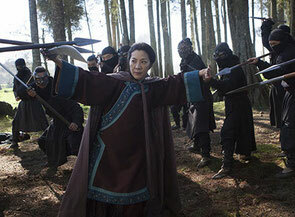 Regardless of how much time has passed or how radical the changes in content delivery, Crouching Tiger, Hidden Dragon: Sword of Destiny is here, and it’s a competently made and visually impressive, though hollow, shrunken version of the original classic. Michelle Yeoh reprises her role as Yu Shu Lien, emerging from an 18-year seclusion that followed the solemn ending of the first film. She resurfaces just as there’s a new threat to steal the Green Destiny, the powerful sword of her former master. The evil West Lotus clan, led by Hades Dai (Jason Scott Lee) wants to steal the mythical sword to aid their hostile takeover of various territories. Joining Yu Shu in the fight against West Lotus is the mysterious Silent Wolf (Donnie Yen) and his ragtag group of warriors, as well as eager new pupil Snow Vase (Natasha Liu Bordizzo). Sword of Destiny doesn’t match the grand lyricism of its predecessor, which there’s no shame in and would be perfectly fine if it completely gave itself over to being an action-oriented martial arts tale. The problem is it goes half-way, sprinkling in context-free action sequences with thematic beats that try, and fail, to replicate the deep meaning of the first film. Every time swords were crossed and combatants floated through the air in the first Crouching Tiger, there was meaning ascribed to it. In Sword of Destiny, there are fits and starts of action and broad dramatic strokes that don’t built a cohesive narrative tapestry. It means nothing when Yu Shen’s carriage is raided in the opening moments or when West Lotus ravages a rival clan because the dramatic stakes aren’t clear. There are some standout moments, mostly those involving Yen. His economy of fighting motion is fun to watch and really stands out in a tavern skirmish and a beautiful-looking fight on a frozen lake. It’s no huge surprise that the battles are choreographed well, as Woo-Ping Yuen – the great fight coordinator of the original, as well as the Matrix and Kill Bill films, takes over directing duties. The struggles exist in making us care about battles and their participants. Death scenes are treated as powerful moments, but it’s hard to be too affected when we’ve spent little time with the vanquished and even have a hard time keeping straight who is who. There’s also the recycled theme of love that wasn’t meant to be and cannot be, made stranger by undoing crucial information from the original. It just comes across as convenient. As does the juxtaposition of this solitude of older warriors with the burgeoning love of young trainees. Snow Vase is given a backstory that connects with a present love interest that’s not nearly as fleshed out as Ziyi Zhang’s memorable arc last time around. It also feels weird that the Asian cast speaks English, no doubt to make the film appear more accessible to a wider streaming crowd. The language highlights the shift from authenticity to approximation, with Sword of Destiny stuck going through the motions – however elegant some of those motions are – to get to a neat, artificial end.